This is the last of my monthly notes to you. I enjoyed writing to you even if the deadline always came up to quickly for me. That is probably why it has always been short. I’ve only had a few minutes to get it in on time! Farmers always have interesting and challenging years, don’t we? We never know what to expect except the unexpected! I was glad to serve as your President for one year. It was what I expected but much more. Like most of us, I would rather others make the moves so I wouldn’t have to take the responsibility. It was good for me for once to step up to the plate. Maybe I won’t be too critical then in realizing there are intangibles that are not so easily detected until personally undertaken. My hat is off to all of you who pitch in to help make KCFA a cognizant organization worthy of the social, business and political network of Kona coffee farming. We have threaded our way through the maze of obstacles that always appear as we worked to improve what KCFA is this last year. It is likely that some detours have and will be taken as we learn by experience. It will be interesting to see how our new board faces the challenges of 2016. Come and see who our new board members are (there will be five of them!) at our Annual General Meeting (AGM) on Friday, January 8, 2016 at Kahalu`u Beach Park Pavilion. It’s a potluck, with KCFA providing the main course of pulled pork sandwiches. It’s always a fun time at the beach. Come and hear what your 100% Kona Farmers Association has done over the last accomplishing year. Hang out with your fellow farmers and cast your vote for the new KCFA Board Members to represent you. Also we will vote on By Law changes. As a non-profit, KCFA Members must rely on each other, so come and learn the latest. 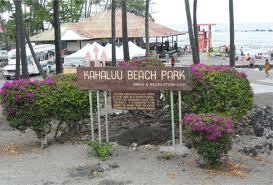 The Kahaluu Beach Pavilion is a warm and a relaxed setting with the beautiful ocean nearby. Bring your suits! We plan to have some beer and pupus from 11:30, and the Potluck lunch will be served at noon with our Annual Meeting to follow. KCFA will supply plastic ware, paper products etc. and will again offer Mary Lou’s yummy shredded barbeque pork on rolls. Please RSVP (just click>>>) here so we can have an accurate count of what we need to get. We ask you to bring your own drinks and to bring something small to go along with the pulled pork sandwiches- from pupus to side dishes or even… just bring yourselves. See you Friday! The Kona Historical Society recently launched its first-ever crowdfunding campaign — Charlie Needs A Bestie — on Razoo.com for an approximately 25-year-old donkey, who needs a friend and an upgraded home. For more than a decade, Charlie has captured the hearts of many who visit the Kona Coffee Living History Farm in Captain Cook, which is the only living history coffee museum in the U.S. Charlie helps tell the story of the Kona Nightingales, donkeys that were used as transportation, ideal for hauling coffee, shared between farmers and were famous for their braying. Charlie’s personality has made him perfect for demonstrating these tasks and for school programs, which expose children to coffee farm life and animals from 1920 to 1945. Charlie is sweet, gentle and docile, but he’s also lonely. His only companions are the chickens and other birds that visit him during meal times. 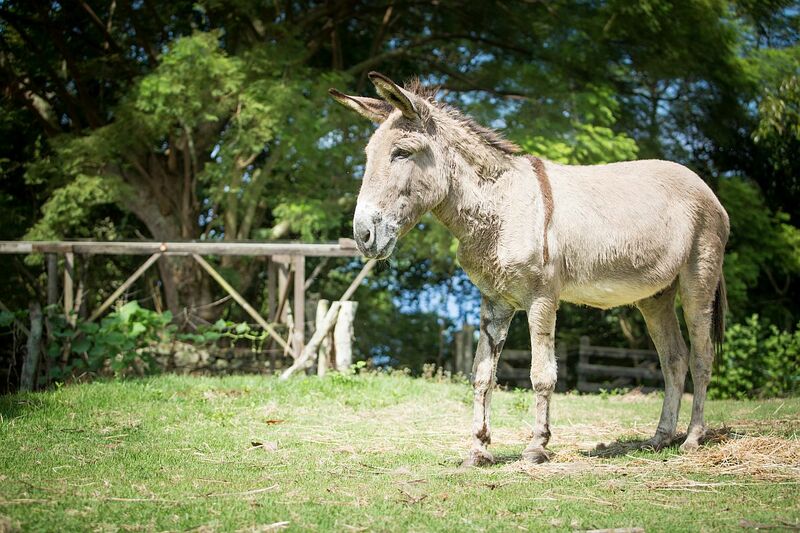 Donkeys are herd animals, which is why the Kona Historical Society wants to adopt or rescue a friend for Charlie. But before Charlie can have a bestie, Kona Historical Society needs to make improvements to the pasture, from clearing land overgrown with invasive weeds and plants to installing fencing and fixing the manger. As a nonprofit, Kona Historical Society also needs money to pay for the care of Charlie and another donkey, as well as for medical supplies and farrier visits. Charlie has a chronic foot problem, a genetic condition he’s had since his discovery in the wild and being donated to the Society’s farm. 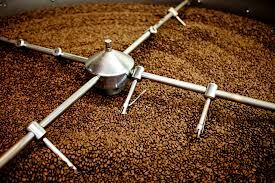 WASHINGTON – Last week the Washington Post put a spotlight on a coffee roasting trend that combines the aromas of booze and beans—a perfect marriage of flavors for some coffee enthusiasts. “The aroma alarmed me. It filled my car with the sweet, woody burn of whiskey, as if Hank Williams were riding shotgun with an open bottle in his hand,” writes Tim Carman, referring to a cup of Baby Rye Rye coffee prepared at Qualia Coffee in Washington, D.C. The reserved line of Colombian beans are aged for about two weeks in a charred oak rye-whiskey barrel, then roasted and rested, the author notes. Joshua Harding, design and marketing manager for Ceremony Coffee in Annapolis, Md., told the news source that green, unroasted coffee beans are highly absorbent, soaking up the aromas of their environment. Unfortunately, this can also include burlap bags and the exhaust of trucks in poorly packed shipments to roasters. Chris Vigilante, founder and roaster at Vigilante Coffee in Washington, D.C., told the Post that his process ages Sumatra beans in a 9-year-old bourbon barrel from One Eight Distilling after he roasts them. He sells the barrel-aged beans as a cold brew for $4 for a 16-ounce serving. The downside to the popularity of barrel-aged blends, Vigilante commented, is that it flies off store shelves faster than it takes to produce a small batch of beans. PORTSMOUTH (Us) – A new coffee created by a local organic chemist and marketed by a Portsmouth start-up incubator combines the perk-me-up qualities of java with the heart-healthy qualities of antioxidants found in red wine. The product is CoffVee, Arabica beans infused during roasting with resveratrol, the naturally occurring antioxidant found in the skins of grapes used to make red wine. It was created in a patented process by Glen Miller, an organic chemist who currently chairs the Chemistry Department at the University of New Hampshire in Durham, where he’s been for 20 years. Miller is working with the New England Innovation Center at 75 Congress St., Portsmouth, for its start-up know how to get the product into the market. “We are thrilled to offer the widely accepted health benefits of red wine to consumers with each and every cup of CoffVee,” said Miller, who is founder, president and chief technical officer for the newly created Vera Roasting Company (www.veraroasting.com). As an organic chemist, Miller said he thinks about compounds, what they do, and what they might potentially do in certain circumstances. He developed the process of combining the roasted coffee beans with the resveratrol in his kitchen. The process, according to Miller, not only infuses the beans during roasting, but also provides the same amount of resveratrol in a cup of coffee as is in a glass of wine. Infusing resveratrol into coffee in a form that promotes bio-absorption is a first for the coffee industry, according to the company. 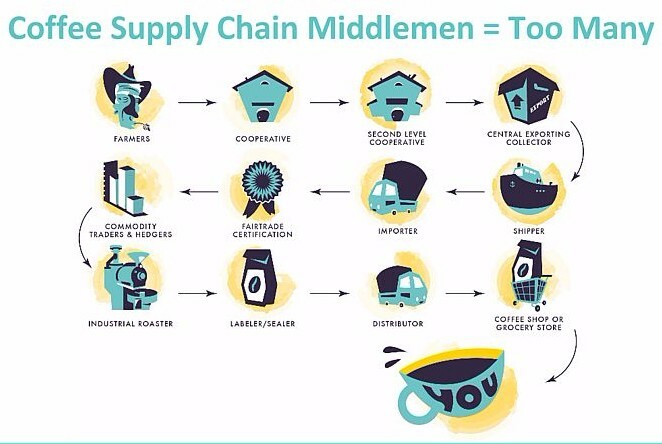 “We think we’re on the verge of making the transformation of the coffee industry,” Miller said. The KCFA Legislative Committee made a request to Big Island Senator Russell Ruderman that he introduce in the Senate a companion bill to HB387. Senator Ruderman has said that he will do so. The Legislative Committee has also contacted Hilo Representative Clift Tsuji, Chair of the House Agriculture Committee, requesting that the Committee show a measure of respect to the Hawaii County Council and schedule a hearing on HB387 early in the 2016 Legislative Session. This year’s Award was shared among seven farms that tied in the point system judged by three local Chefs. There were 37 entries. The chefs were from restaurants that serve 100% Kona coffee. We were lucky to have Morgan Starr from Mi’s Bistro, Haley Archibald from Holuakoa Cafe and Chef Forrest from Lava Java. They took the tasting seriously and used points from 1-5 to grade the coffee. Five being the highest. This year we decided to let them try using a .5 grade. In other words it could be 2.5, 3.5 etc. in hopes that we would have less ties. Obviously this did not work out. The coffees are all so good and close we ended up with ties with all having the same amount of points. Next year we may have a second tasting to try and determine the final winners. 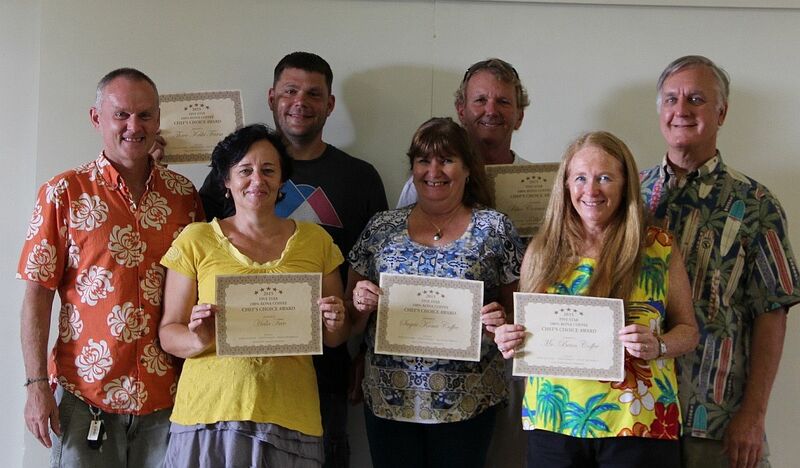 Mr.and Mrs. Orlowski from Hala Tree Farm, Wes Mclaughlin of Three Keiki Farm, Kay Dixon from Sugai Kona Coffee Farm, Jim Kelleher of Blue Corner Coffee and Kathy and Tony Gedeon from Mr. Bean Kona Coffee. Kanalani Ohana Farm and Holualoa Organics also received awards but were not present. This year’s Stroll was bigger than ever with great participation and folks really enjoyed the day and free tastings of 100% Kona coffee. ”Hawaiian Kona Blend” for $4.695/Pound! A long-time KCFA supporter sent the photo that appears above from the Costco store in Madison, Wisconsin. 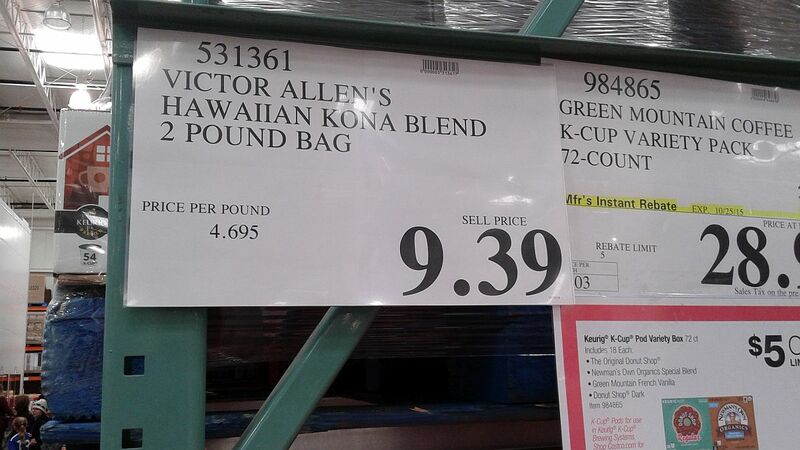 $9.39 for a 2-pound bag of Victor Allan’s “Hawaiian Kona Blend”. She also sent photos of the package’s labeling which in no way indicate that it contains anything but Kona coffee. 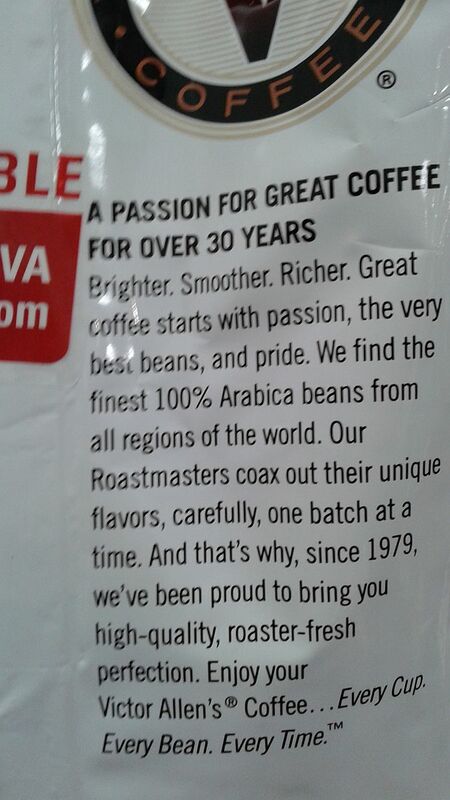 Here is what the side of the packages says: A PASSION FOR GREAT COFFEE FOR OVER 30 YEARS Brighter. Smoother. Richer. Great coffee starts with passion, the very best beans, and pride. We find the finest 100% Arabica beans from all regions of the world.” Where do you think the good people of Madison believe the beans in that package were grown? What percentage would you guess were grown in Kona Hawaii? With the world’s largest coffee-growing regions under threat, two U-M researchers continue poring over better ways to control pests by harnessing the environment instead of compromising it. John Vandermeer (Ph.D. ’68) touches a tree with hundreds of swarming Azteca ants, and the orangish insects skitter over his index finger, invading the back of his hand. It won’t be long before the bugs start biting, injecting a toxin that burns like tiny red-hot embers hitting your skin. Before things get nasty, Vandermeer, a professor of Ecology and Evolutionary Biology, gently shakes off the ants and reflects on the role they can play in the massive global industry that produces coffee—the essential day-starting beverage for millions, if not billions, of people worldwide. “You see a lot of insects that are predators of pests. One particular ant species we noticed is the very aggressive Azteca,” says the bearded professor, wearing a wide-brimmed hat to shield himself from the Mexican sun that’s trying its best to scorch the back of his neck. The ants protect the plants from the coffee berry borer—the biggest insect threat to the crop across the world. When the Aztecas see the tiny beetles, which eat their way into coffee berries, they scurry over to the beetles, pick them up, and toss them off the plants. For nearly two decades, the LSA ecologist and his wife and research partner, Ivette Perfecto, have been roaming—and sometimes crawling—around the coffee fields here in the mountains of Mexico’s southern Chiapas state, near the border with Guatemala. They’re trying to understand the complex relationships between the insects and other organisms that live among the lush green plants that grow the bright red berries that eventually help fill our coffee cups. EPA new rules regarding farm workers and pesticides. These were twenty years in the making. This following link is an article from NPR’s ‘The Salt’ with EPA’s rules document link. Costco & Oxfam’s approach brings together growers, workers, and retailers to produce better fruits and vegetables. Judging from the numbers, you probably enjoy your morning cup of coffee as much as I do. Global coffee consumption has doubled over the last 40 years. An estimated 2.25 billion cupsof coffee are consumed around the world each day. Americans alone drink about 400 millionof those. That’s what Vega Coffee, a startup working out of New York and Nicaragua, is trying to change. Vega Coffee’s model has been dubbed the “Etsy of coffee” — beans processed, roasted and packaged by those who grew them, and then delivered to your front door. Along with several other coffee innovators, the company is trying to rethink the way coffee is sold and thereby empower the farmers in the field. 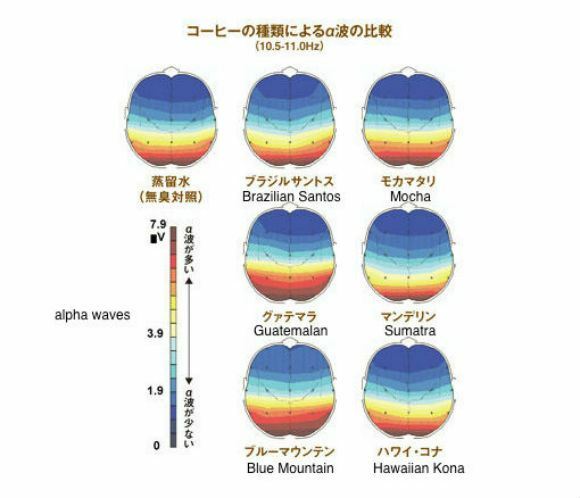 Recent studies in Japan found that the smell of certain types of coffee beans increased the alpha waves in the brain. These same waves are found in high levels when you’re in a relaxed state. Scientists proved this by having participants simply smell a variety of freshly brewed coffees while testing their brain waves. Relaxation ensued for those who smelled Guatemalan and Jamaican Blue Mountain coffee. The studies also found that roast matters too; dark roasts have a more stable affect, compared to medium roasts. Who knew that just the smell of the beans could influence your brain so much? Now you know that if you have to stay up late working or studying, you should stick to Brazilian Santos, Hawaiian Kona and Sumatra. But, if you’re just letting off steam with friends, try the relaxing beans of Guatemala and Jamaica and remember, make it dark roast for a fuller effect! Change up your morning fix by getting dirty, as in “dirty chai” – a chai latte with coffee. Steep 1 chai tea bag in 1/2 cup hot water, then blend with 1/2 cup strong hot Kona coffee. Add a 1/3 cup of steamed milk for a special treat.